Medical – AES encryption meets HIPAA requirement for securing data over open networks such as the Internet. Ideal for emergency and portable medical operations. Field personnel working in temporary and remote locations. 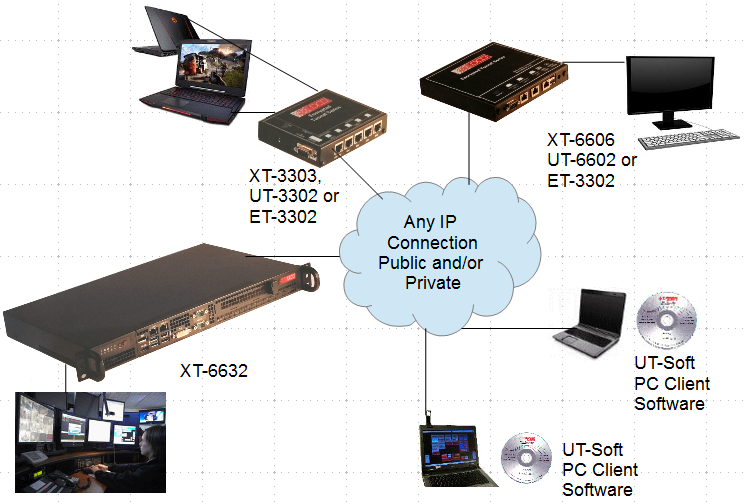 XT products create an encrypted tunnel through IP networks. They create an encrypted Layer 2 tunel via Layer 3 IP networks. In it's most simple form, the XT is a "lump in the cord" between a protected LAN and an unprotected WAN. XTs use either UDP/IP or TCP/IP for transport between units, and are compatible with other XT units as well as DCB's UT and ET products. The UT-Soft software client also works well with XT servers to provide a remote PC client. XT series products operate in server-client pairs (or using multiple clients and servers in a system). The XT series encrypts the path between units using AES encryption. AES is the US Government standard. 128.192, or 256 bit AES encryption are supported. Depending upon the model, XT trusted ports are either ethernet 10/100BaseT or 10/100/1000BaseT. The WAN, or untrusted, data port is an ethernet port running 10/100BaseT or 10/100/1000BaseT. WAN port data can be sent encrypted or unencrypted. The serial port is used only for setup. The XT tunnels operate through firewalls with only one UDP port of your choice opened. It bridges all ethernet protocols including IPX, IP, NetBEUI, VOIP, ROIP, and other proprietary protocols as well as multi-cast. The XT series is straight-forward, easy to configure and maintain. Each XT encrypts an entire location for 100s of PCs and other devices. Units configured as a server typically has a fixed IP address. Clients may have fixed IP addresses or obtain a dynamic address. Dynamic DNS is also supported for server locations that do not have a fixed address available. Upon power-up, the clients attempt to create a persistant connection to the configured server. If a redundant server is configured, there is automatic fail-over between the primary and redundant server with automatic recovery when the primary link is again available. Most XT products contain a serial port may be configured as a single port terminal server. This allows the XT to interoperate with DCB's EtherPoll SCADA communications system and other encrypted XT devices. This also provides an encrypted connection for the serial data. The XT series provides state-of-the-art straight-forward, easy to configure AES encryption security without the configuration complexity of normal VPNs. Due to the encryption employed in these products, XT series products are export controlled items and are regulated by the Bureau of Industry and Security (BIS) of the U.S. Department of Commerce. Some are classified as mass market encryption devices and may not be exported or shipped for re-export to restricted countries in Country Group E:1. They are shippable to most other countries. Please call if you have any export questions. Each unit may be configured as a server, client, or both. Extensive filtering on source and destination IP and MAC address, TCP port, UDP port, protocol, etc. Dimensions 6 5/8" x 6 1/4" x 1 1/4"
The XT family products create an encrypted tunnel which passes Ethernet packets between two trusted LAN segments. All ethernet protocols are bridged between the units. The XT operates in conjunction with other XT, ET, UT units and UT-Soft. One unit is required for each location. Multiple client units may be connected to the same host unit, and a client may be connected to multiple host units (daisy-chained operation). A host unit may be configured to block client-unit to client-unit connections, or to allow them. All XT series units are compatible. The following application notes were written for the UT and ET series products. The concepts and many operational details are identical to those of the XT products. You may order these on-line, but if this is your first XT installation, we prefer that you phone us and discuss your application prior to ordering. Our consultations are always free!